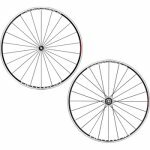 The Campagnolo Neutron is a mid range clincher available in an Ultra version as well, used for time trials over hills or century rides. Also suitable for any competition except fast time trials. They are rigid laterally but vertically elastic, thanks to the asymmetry of the rear rim spoke drilling and the special rim section design. Strong and long-lasting. Lateral machining of the rim provides a top level braking surface. The Record class hubs rotate on very precise adjustable 15-ball bearings. Release system has bilateral-acting light-alloy lever. 1550 grams pair. The Neutron Ultra clincher has extremely low weight due to the wall dimensions, top bridge design and carbon fibre hubs. Plus: Differentiated spokes, Welded joint and machined sides, Variable section stainless steel aero spokes, Nut-plate system with ball coupling, Ultralinear geometry, Carbon and aluminium hub bodies, Self-locking nuts, Rear hub with oversize right-hand flange, Cup and cone bearings, 4x15 balls 5/32" in Grade 10 stainless steel, "ceramic ready" bearings, Standardised front-rear bearings, Monolithic FW body, Polygonal rim, Oversize light-alloy axles, Differentiated front-rear rims, Locking with light-alloy lever housing and Symmetric Action light-alloy lever, Rear rim with asymmetrical drilling, Milled rims on the front bridge.